Dar es Salaam — President John Magufuli will today open a meeting on minerals. The event will take place at a time when extractive industry experts say serious challenges dog the minerals sector and the situation denies Tanzania an opportunity to enjoy proceeds of its resources. The challenges include secrecy, high costs of explosives, inadequate study on the location and depth of mineral rocks at Mirerani and unexploited mineral sites owned by large-scale investors. Recently, President Magufuli reshuffled his cabinet. He appointed Mr Dotto Biteko as the new Minerals minister, replacing Ms Angellah Kairuki. During the swearing-in ceremony, President Magufuli said he removed Ms Kairuki for failing to stop the smuggling of gold out of the country, with a recent case being that of attempting to spirit away 323.6 kilos of the mineral. But experts say the challenges are just too many. As outlined by the East Africa Regional Office of the Society for International Development, secrecy in mining contracts and the lack of involvement of citizens in decision-making regarding the country's resources, remain major challenges. 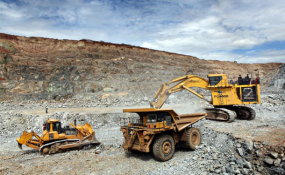 Manyara Regional Miners Association former chairman Sadick Mnenei told The Citizen yesterday that it was important for the government to lower taxes to avoid sellers shifting the burden to miners. "Traders attribute high costs of explosives to high taxes imposed on minerals. The government should act accordingly." He also pleaded with the government to send experts to mining areas to conduct a study on the location and depth of mineral rocks. "Currently, we work blindly." Small-scale miners also complain about big chunks of mining blocks, belonging to large-scale investors that have been lying idle for years. Tanga Regional Miners Association secretary Nassoro Mwaupea told The Citizen that leaving those mining blocks unexploited for a long time was a waste and encouraged the invasion by artisanal miners who sell minerals to middlemen who in most cases smuggle them out of Tanzania. A researcher on extractive and energy resources at Roskilde University, Mr Thabit Jacob, told The Citizen recently that the big question in relation to the challenges facing the Ministry of Minerals was how much powers the minister had to make concrete changes and decisions. "Powers to make key decisions in both Energy and Minerals lie with the President, , through the Cabinet," he noted.